What is the fastest way to identify the fonts used in a webpage? Well, you may use Firebug or Webkit Inspector to figure out the font by viewing the page source, but it is too complicated and time-consuming. With WhatFont, you can now find the fonts used in a webpage with just one click. WhatFont is a web browser extention/bookmarklet tool that enables you to easily find out the font information about the body text and title text on any webpage. It currently supports all major browsers including Chrome, Firefox, Safari, Opera, Internet Explorer. To use it is really easy, after you have added it to your browser, refresh any already loaded webpages that you want to use it on and click on the bookmarklet or extension. Now when you hover over any text, the font name that sets the text will be displayed. If you click on it, you will get a pop-up with more detailed information such as the font family, size, line height, color and sometimes the source of the font. 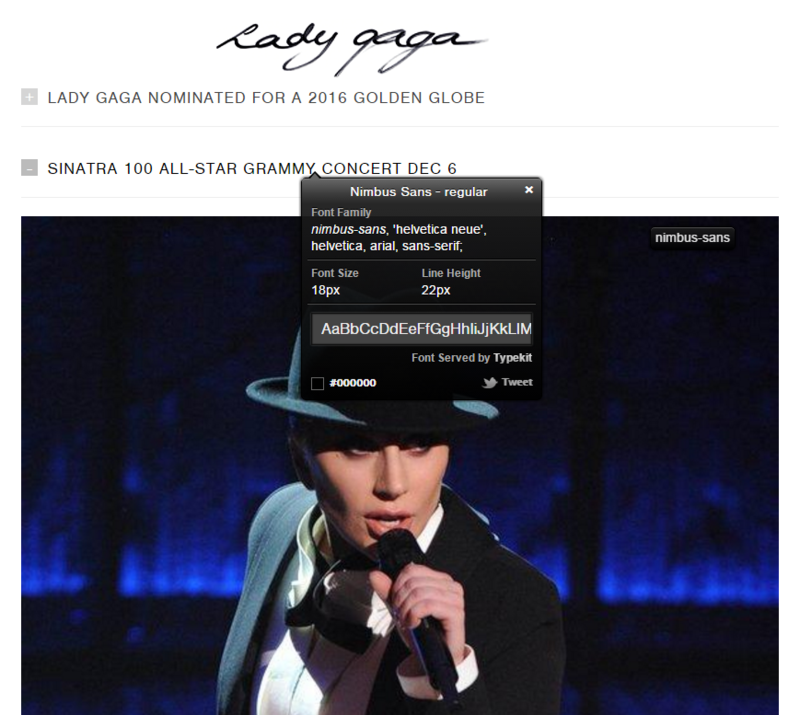 For example, the image above is a screenshot from LadyGaga.com, as you can see that using WhatFont we find the webpage uses Nimbus Sans Regular for the article titles and the font is served by Typekit, a renowned subscription font service. WhatFont is available as an extension for Chrome and Safari, and as a bookmarklet for other browsers. Now it is also available as an app for iOS devices, available on iPhone, iPad and iPod Touch with iOS 8. For details about installing and using it, you can visit its website.